Try out this super-easy, everyday ponytail that is voluminous and bouncy. Ponytails are usually synonymous with sleek hair but my super-frizzy hair does not give a toss. My go-to hairstyle for almost everything from work to play is a half-up, half-down ponytail. It keeps the hair tangle-free and away from my back, and is not flat, but bouncy and voluminous. Not as serious as a bun and far more convenient than open hair. My hair is quite long and leaving it open and loose everyday would mean serious detangling every night. All you need for this look are two accessories - a hair tie or a scrunchie, and a claw clip. I recommend the flat-backed revolutionary Linziclip, with hidden springs - reviewed here. The beauty of this style is that the hair tie is hidden, so you can actually wear a scrunchie without feeling that the world is laughing at you for staying back in the 1990s. Here's how you get this fuss-free, wearable frizzy-hair ponytail. Begin with a medium ponytail, using your hair tie or scrunchie. Now hold up the pony tail along your scalp. 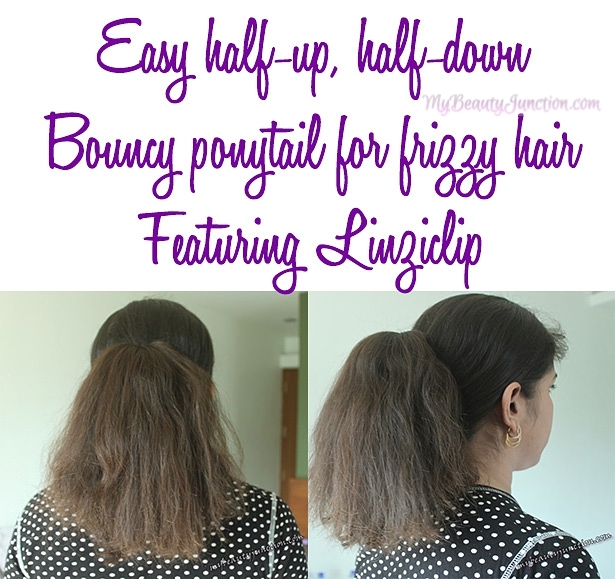 Secure the length of the ponytail to the hair on the scalp with a Linziclip. Midi-sized is best. Let go of the ponytail so it falls over the clip, covering it entirely. Detangle any kinks out gently with your fingers. You can pick up Linziclips from Amazon here and eBay here. Both ship worldwide. Now a picture is worth a thousand words, so here are 3,000 words. You can pin this tutorial for later. Do you have frizzy, long hair? If so, how do you deal with it for formal and casual occasions? Tell me in the Disqus comments widget below!